My first visit to Sorrento was 15 years ago when, by mistake, I found myself driving around the Sorrentine Peninsula and along the Amalfi Coast rather than visiting Pompeii. In those pre-sat nav days I’d taken the wrong turning somewhere along the Bay of Naples. It was a fortuitous mistake in that the drive along the winding coastal road was brilliant (one of my Top Ten Road Journeys of the World) and the towns along the way were quite breathtaking. I vowed then to return to explore Sorrento and Amalfi and to travel out to the little island I’d seen on the horizon, the isle of Capri. The opportunity arose when I was invited to a wedding in Sorrento – an increasingly popular wedding venue for British couples. Once I’d recovered from the wedding festivities, I was free to explore. Sorrento has long been popular with British tourists, starting with Lord Byron almost 200 years ago. It’s still retains much of the charm that attracted Byron, with small alleyways clustered around the main square, the Piazza Torquato Tasso, all perched on a clifftop below steep hills. 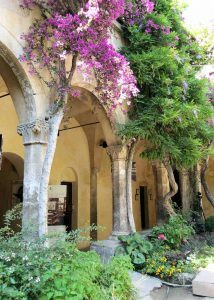 Heading from the main square down towards the busy harbour takes you past the 14th Century Chiesa di San Francesco church, whose tranquil cloisters provide the backdrop for many a wedding. The views across the Bay of Naples towards Vesuvius are quite stunning, particularly at sunset. Don’t forget to sample Sorrento’s own special liqueur, Limoncello, made from the zest of locally grown lemons. It’s not the sort of thing I normally drink, but when in Sorrento, do as the Sorrentans do! 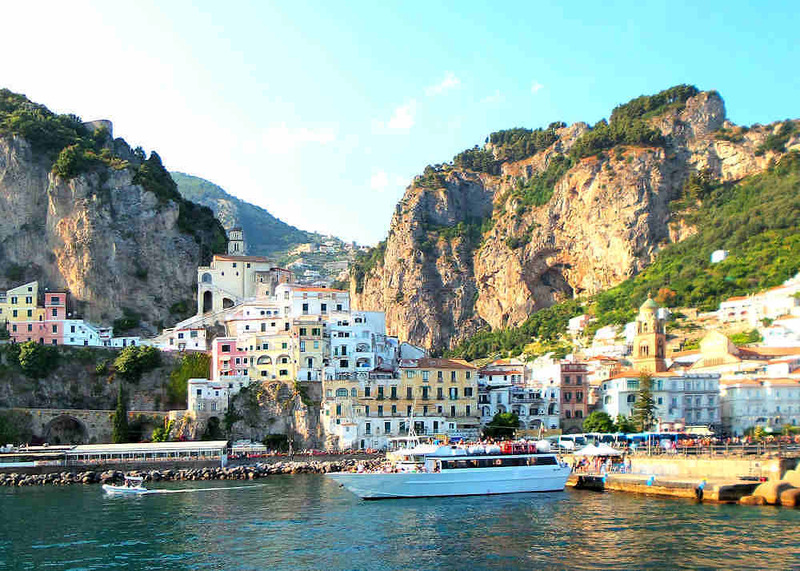 If you are not too worried by the thought of twisty mountain roads perched above sheer drops into the sea, then take a trip along the coast to Amalfi. 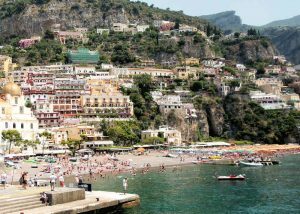 If you are a beach fan, then stop awhile at Positano along the way. 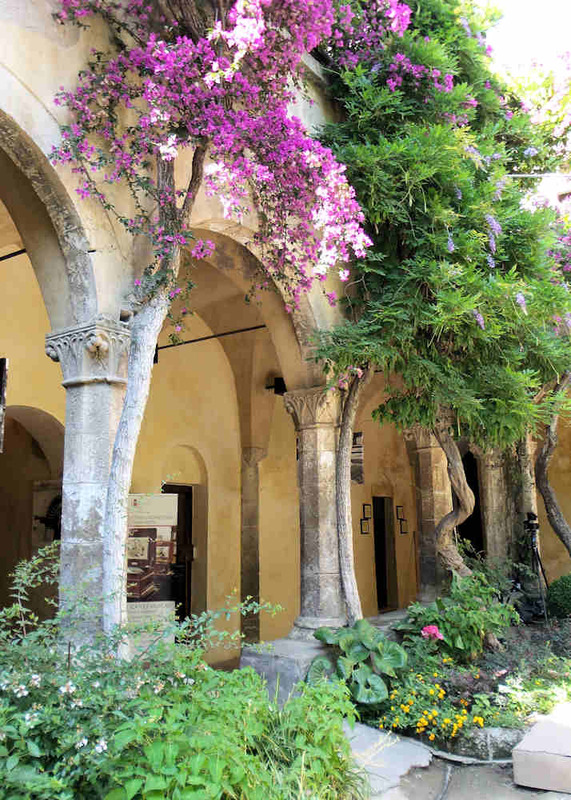 Amalfi, nestling below steep cliffs, has the majestic Arab-Norman Cathedral of St Andrew in the town centre. 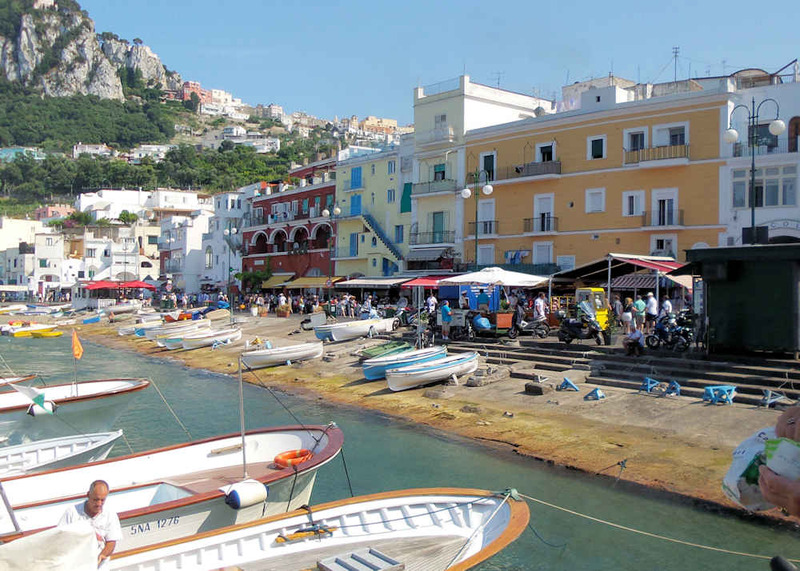 A 20 minute ferry ride from Sorrento takes you to the busy port area of Capri, the Marina Grande. It’s then a steep walk up to the centre of Capri, or you can take the funicular. The pedestrian-only centre is bursting with restaurants and very, very expensive fashion shops. I thought at first the prices were still being given in lira rather than Euros! Like Sorrento, Capri has long been popular with British tourists. Older readers may well remember Gracie Field’s love affair with the island, culminating in her burial there in 1979. I enjoyed wondering around the small, winding streets away from the rather tacky main shopping area – the panoramic views back towards the the Sorrentine Peninsula and across the Bay of Naples are magnificent. However, a bit like Las Vegas, I think one visit is enough for me. Of course you can’t visit Sorrento without exploring the ruins at Pompeii and Herculaneum (10 miles to the north-west of Pompeii). However, I suggest you choose a cool, maybe overcast day as there is little shade at either site and the shiny stone pathways reflect the sun’s rays. Herculaneum is more compact than Pompeii and more accessible to less nimble senior travellers, as mentioned in a previous post. If you are travelling independently then several airlines fly from the UK to Naples with return fares ranging from £100 to over £200 in the summer high season. Car hire is relatively inexpensive, but then driving in the Naples area is quite hairy. Almost every car has dents and scratches and that’s without the problems presented by the hairpin bends and sheer drops on the Amalfi Coast road. Summer weekends are particularly bad as every young person in Naples heads to the peninsula on motor scooters that weave in and out of the traffic at great speeds! Make certain to take out car hire excess insurance. 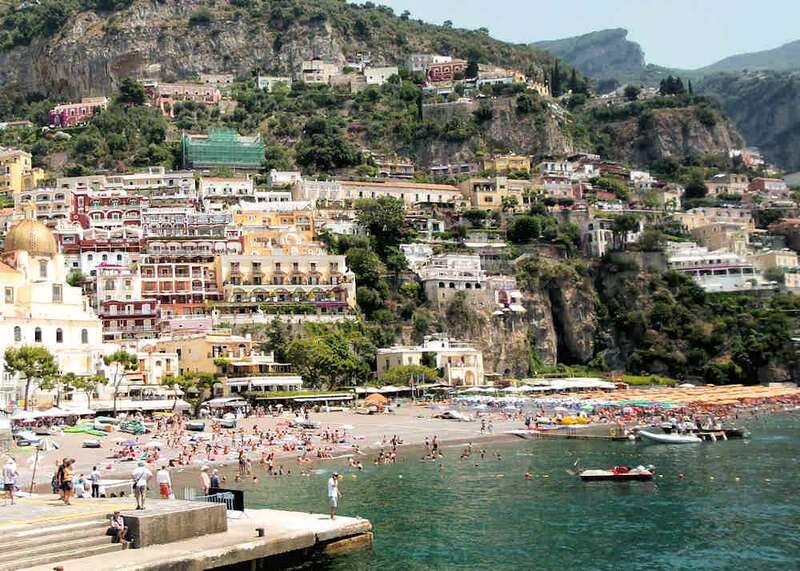 Hotel prices vary considerably depending on season, rising steeply in the summer months when hotels in Sorrento can get fully booked well in advance. A good alternative if you have qualms about the driving, but still want to see the sights of the region, is to book a package holiday. For example, First Choice have holidays to Sorrento with excursions along the Amalfi Coast and to Capri and Pompeii and Herculaneum. Senior travellers who are not tied to school holidays should definitely plan Sorrento visits for the quieter and cooler spring and autumn periods. As well as saving money compared with high season, everywhere will be much less crowded with less queueing. 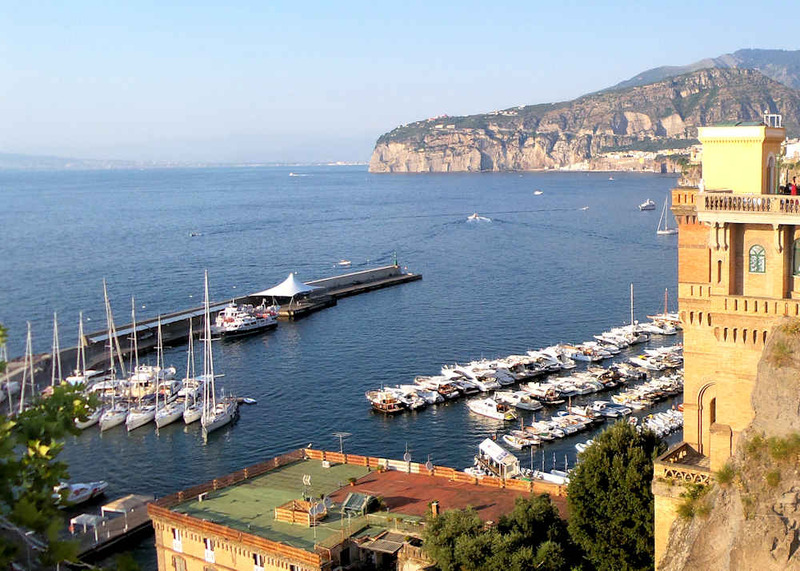 It is also well worth considering Sorrento for a winter break with typically 6 hours a day of sunshine in both December and January. See Weather Annual Averages for Sorrento.